The one I have bought from Oasis is sold out online, but I’m sure if you head in store they may still have them. It was priced at £40, I paid £30 on Black Friday so who knows you might still be able to get it at that lower price too. This lovely soft grey jumper is a fitted style, it’s a mix of silver and gold stars which I was keen on, because my jewellery tends to be a mix of both – so this helps me with not having to match up my metal tones. 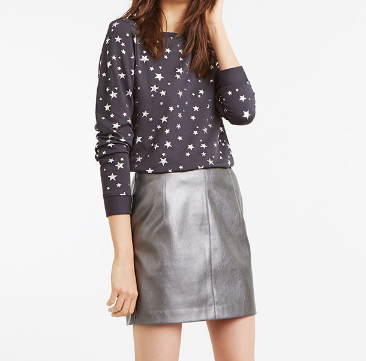 I found this great alternative star jumper on the Oasis site, I absolutely love this with the leather skirt, a real rock chick vibe… but still keeps you in the spirit of celebrating. 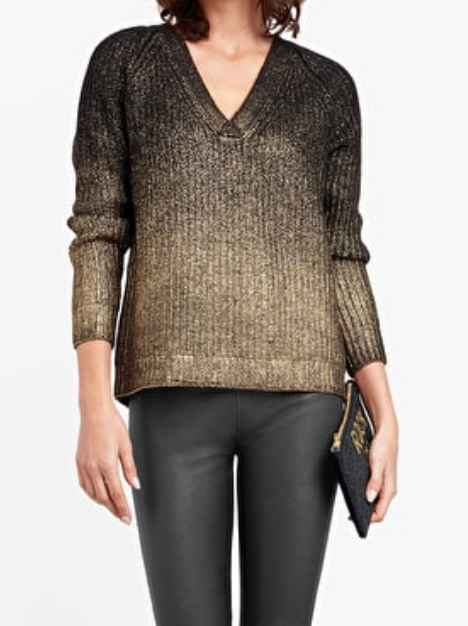 I am loving the faux leather embellishment on this jumper, a great alternative to sparkle and tone-on-tone can look very sophisticated. With the popularity of leather trousers and skirts at this time of year this is one that will look great over Christmas but will easily take you up to Spring – a great investment at £45. 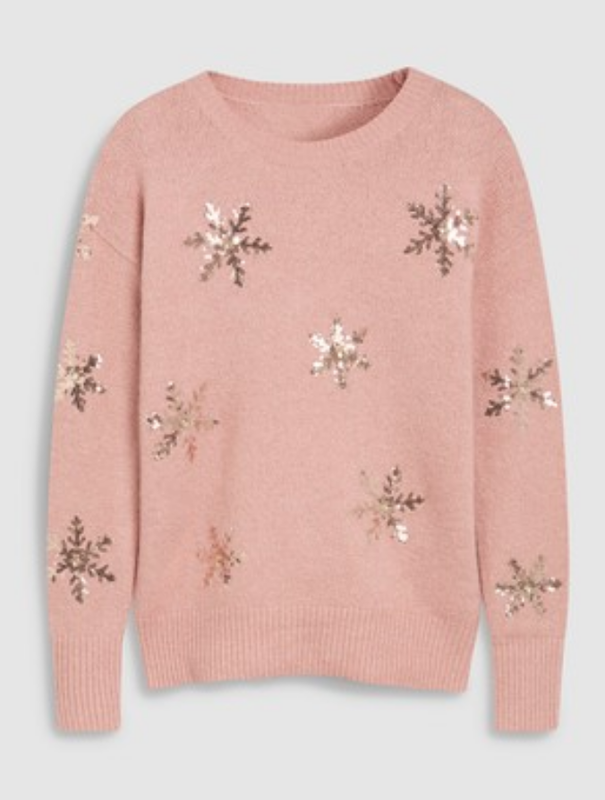 If you bought into the corduroy trend with either pink, burgundy, green or purple, I think this blush pink jumper from NEXT is the perfect way to “Christmas” it up! As the snowflakes are on the sleeves as well, this is perfect for under the pinafore dress, dungarees, with a mini or simply teamed with wide-leg trousers – versatile number and a great price at £28. 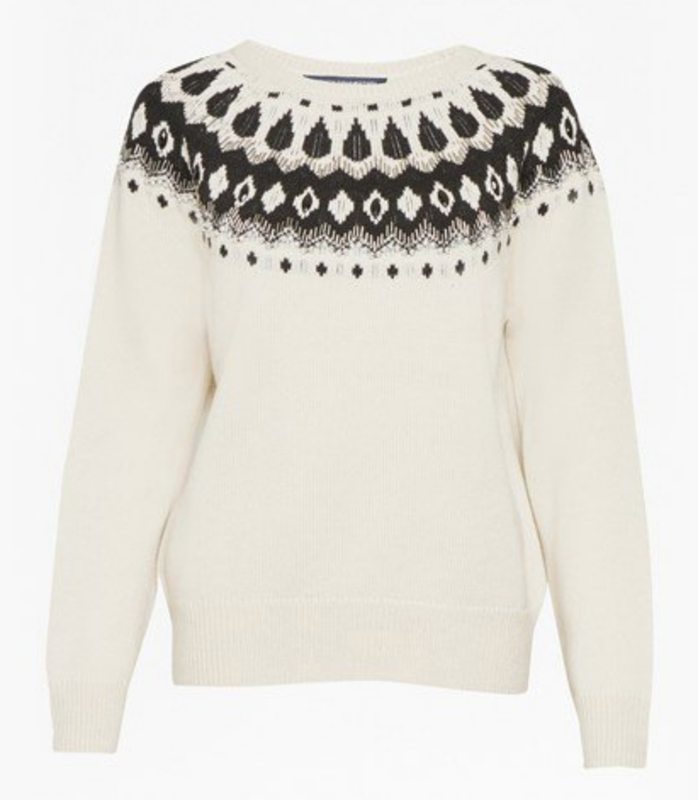 This next jumper is a classic Fair isle knit, it oozes style and chic and the black beaded embellishments elevates this simple classic. Perfect for this winter, allowing you to capture the spirit of Christmas but then taking it beyond into the New Year months. This classic is not a trend, so a great investment to your winter wardrobe, this year and future years. Hush Homewear is known for their star design jumpers and if that’s what you are looking for then I highly recommend you take a look. If stars are not your thing, then I’ve picked out this number – this is perfect for an evening event where you’ve been ‘told’ come wearing a Christmas jumper and if you are in any doubt just how Christmassy the other guests will be and you want to stay chic, I think this is ideal. Take a black fluffy yarn… knit a jumper… add some pearls and what do you get? I think quite a glam look. This number from Sosander is lovely. Their clothing generally comes up big, I think you need to have this fitted especially of you have a defined waistline, so perhaps consider sizing down. The Christmas candy cane jumper on Topshop online is trending at the moment – It’s so utterly simply but gives that nod to Christmas and I love the red detailing on the hem and cuffs too. A fab price at £22. I was a little hesitant to show this one, as it’s in the sale and there are only a few sizes left, but I love it and it gives the nod to the cape trend that’s quite popular this winter. This design is best for those that have a defined waist and who are not too heavy on the chest. The post THE SUPER STYLISH NOT SO CHRISTMAS JUMPER was on Loved by Lizzi first.